What constitutes the quality of our food? In addition to nutrient content and pesticide residues, the sustainability of food becomes more and more important. Experts from the Swiss Research Institute of Organic Agriculture (FiBL) have explored different aspects of the quality and sustainability of organic and conventional food in a new dossier. Organic food should be tasty, healthy, environmentally friendly and produced in a fair manner. The high expectations on the products make it clear that the quality of food cannot be reduced to individual criteria, but must include the entire process from production to the plate. 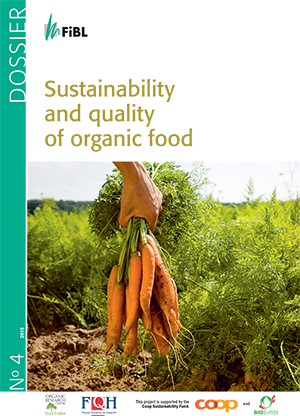 In the new edition of the dossier "Sustainability and quality of organic food" FiBL’s Regula Bickel and Raphaël Rossier illuminate the various aspects that contribute to the quality of food. The 28-page standard work describes a contemporary, holistic concept for the evaluation of food quality. The differences between organic and conventional food are examined and clearly documented with examples, based on selected aspects and current knowledge. The authors explain the sometimes complex issues in an easily comprehensible manner. One of the examples used is organic dried apricots. They are usually of brown to black colour and at first glance seem unappetising, but their taste can compete with conventional apricots. The colour difference is due to the absence of sulphite in organic dried apricots. This preservative prevents the colour change in conventional apricots and protects them against fungi and bacteria. But as dried fruits are already well preserved without additional preservatives, the addition of sulphite is not necessary. In organic products this food additive is therefore prohibited. The result is high-quality dried apricots, containing fewer additives and thus more natural than conventional ones. The English language edition of the dossier has been undertaken in co-operation with the Organic Research Centre, with translation by Anja Vieweger and financial support from the Sheepdrove Trust gratefully acknowledged. For UK and Ireland, printed copies are now available for purchase from us via paypal, It is priced at £6 and will be shipped to the UK and Ireland. Purchases of physical copies for other countries, and of the German and French versions can be done through the FIBL website here.